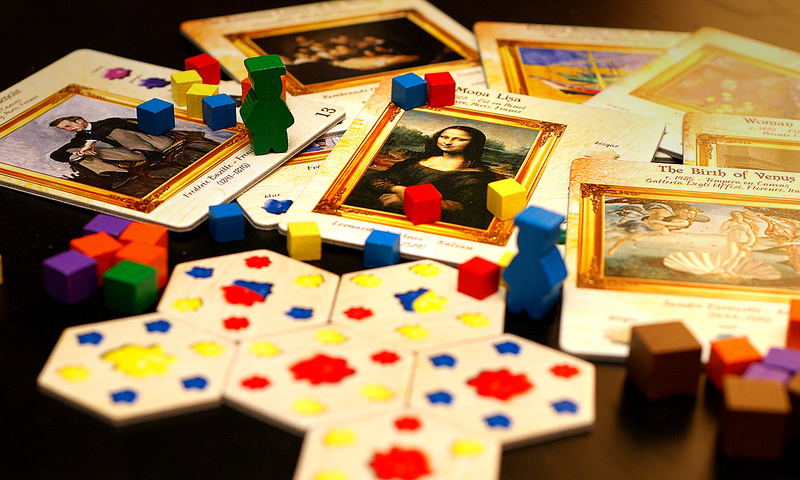 As Big Daddy Kane once said: “Reviewing ain’t easy.” Ok, so I’m taking some artistic license with his lyrics, but I figure that’s ok since today’s boardgaming topic is art – or, more specifically, games about art. Many of us reviewers could be content with just playing a few games and then sharing our thoughts, but that can get boring – both for us, and you, dear readers. And so, it was with great internal fanfare that I came up with the bright idea of pitting two art-themed boardgames against each other: Fresco and Pastiche. I soon found out after playing them both that choosing one over the other was much like figuring out your favorite child: You might have an inkling, but there’s no doubt that your significant other will have wildly different thoughts on the matter. At their core, Fresco and Pastiche are based around the same concept – use your wits and resources to creatively mix a varied palette of colors in order to complete works of art for victory points.That’s about where the similarities end. 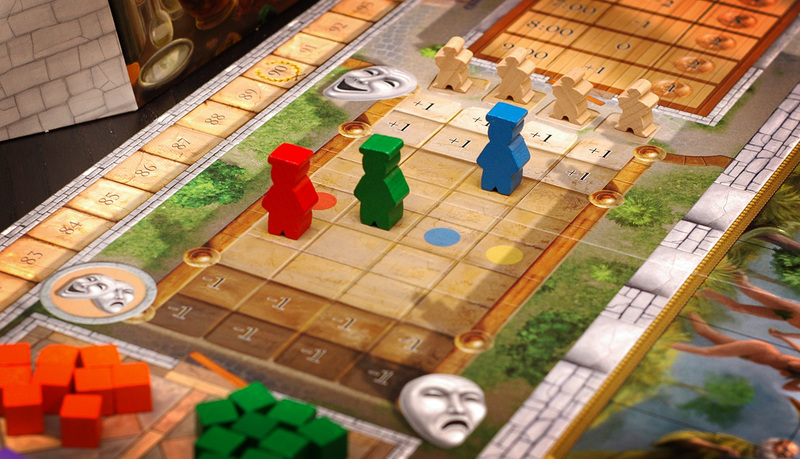 Despite the core concept mentioned above, Fresco is essentially a worker placement game. Each player takes on the role of a talented fresco painter, charged with restoring a key work of art on the ceiling of the local cathedral. In their charge are several apprentices to be assigned various duties during the day, such as gathering paints at the market, painting personal portraits in a studio for money, or restoring a part of the cathedral with the correctly-colored mix of paints. Manage your protegés correctly and you’ll soon become the next Michelangelo and earn the respect of the local bishop. What sets Fresco apart from, say, Stone Age or Agricola, are paints and attitude. 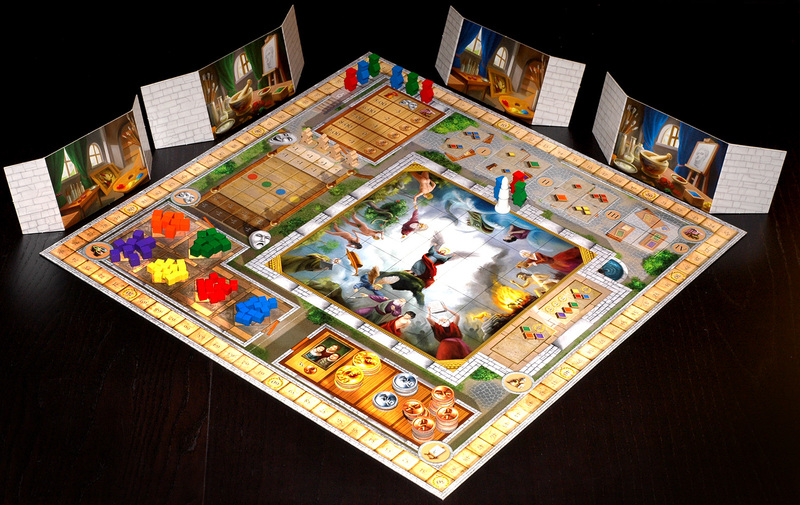 First of all, let’s talk about paint: Fresco is all about the colors, and without the right colored cubes to mix, match and manage, each player will find themselves unable to restore key parts of the cathedral painting. At first, Fresco’s color wheel may confuse some players that don’t have any artistic training, but within a couple of plays it becomes second nature. Most will soon realize that yellow and blue make green, and red and blue make violet. And even though players conceal their colored market purchases behind a personal screen, there soon comes a natural sense of what your opponents are building towards and how you can best get to that part of the fresco first, or thwart their attempts. The second aspect that makes Fresco unique is attitude. Each round, players must decide how early they want their apprentices to get up and get to work. The earlier the start, the more they’ll have an advantage in each task during the day. However, the early risers pay a price: they get cranky. Over the course of the game, this loss of morale could cost a player the use of an apprentice. However, manage your morale wisely and you can actually gain an extra apprentice for actions each round. This emotional tug of war is a fascinating and challenging mechanic that sets Fresco apart from the worker-management pack. In Pastiche, nobody gets cranky except the players themselves, and that’s only when someone gets in their way. Pastiche doesn’t bother with workers, or placement, or decisions of morale – or even a board, really. The challenge that Pastiche offers players lies in how quickly they can create the right mix of paint to restore classic works of art, and how well they can piece together the puzzle that can get them those paint daubs in the first place. Mixing the basics to create the great classics. At the start of the game, each player is assigned two private works of classic art – like the Mona Lisa or Birth of Venus – that they can recreate for points. Four random works of art are also presented to the public for any player to recreate during gameplay. 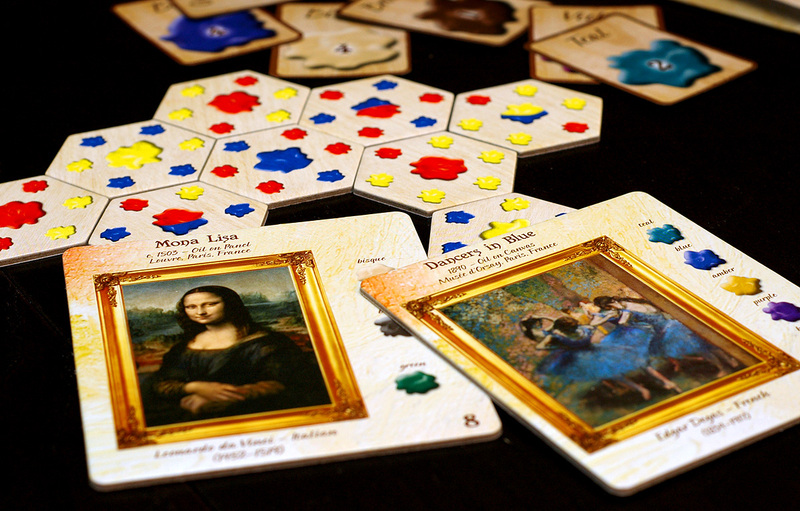 In order to recreate these works of art, players must carefully and creatively match bits of paint on hexes that are placed in the center of the playing area. There are a wide range of color options available to players, depending on hex placement, and the variety is amazing – and appropriate – based on the use of only the three primary colors of red, blue and yellow. To be a successful painter in Pastiche requires a considerable amount of concentration, patience and just a bit of luck. For the most part, player interaction is low, but wise players can offer up trades and deals in order to secure the paints they need to finish their grand masterpiece. The only way I know to describe these two wildly-different games in the same terms is within the realm of art. Fresco lies clearly within the artistic realm of Georges Seurat. The works of art by this famous neo-Impressionist perfectly captures the play and feel of Fresco – the hundreds of individual, independent strokes make up the total sum of decisions on where to go, what to do and when to do it; the careful consideration of light and dark eagerly summarizes the waxing and waning of morale amongst the apprentices; the bright colors – often reminiscent of a new set of starter paints – readily reflecting the limited palette within a new game. At base glance, the sum of these parts form an extraordinary exterior, effortlessly enticing those seeking a new experience despite the familiar underpinnings of those artists who have come before. 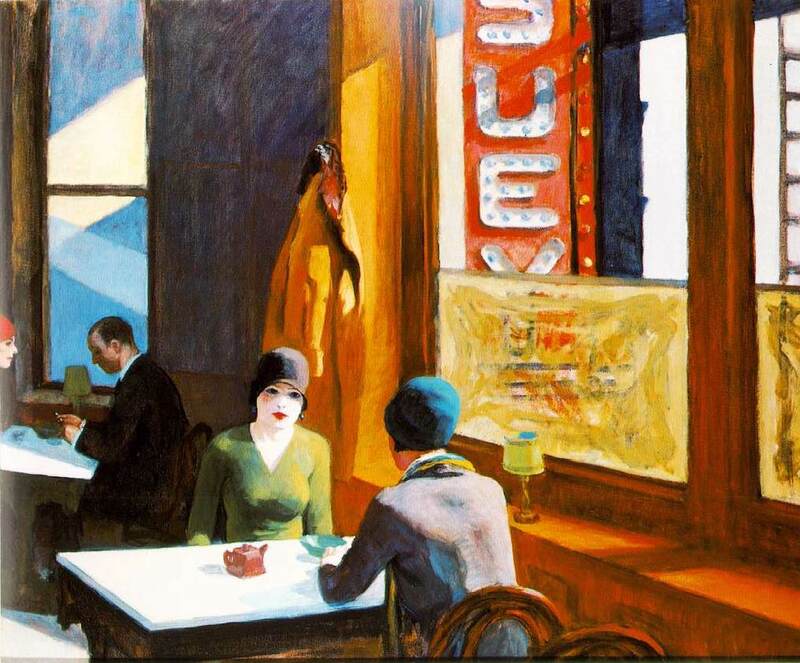 Pastiche, however, is more the purview of the realist, Edward Hopper. This is a work reminiscent of the perfect snapshot, an absolute calm before a brief storm. On the surface, there seems nothing out of place – only the ordinary appearance of color and form and shape of the everyday. Look deeper, however, and one can discover a toil of emotion and a connection with the subconscious that begs the viewer to invest and probe deeper. This is a game – a piece of art – that asks more of its participants’ intelligence and creativity than it first let on. Refreshing, really – just like seeing that first shadow flinch in Chop Seuy or hearing the soft clink of mugs in Nighthawks. However, just as in Hopper’s haunting masterpieces, the viewer – the player – may just find themselves experiencing all that depth in total solitaire. 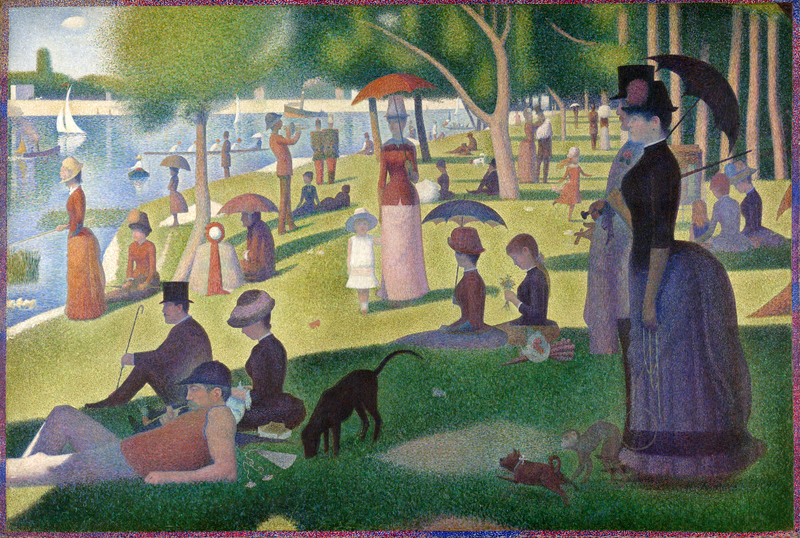 No doubt many will instantly flock to Seurat – the colors, the easy depth, the liveliness, the familiarity. However, a select few – those who have patience and a keen sense of self-reflection – will look past Seurat and see only a stroke of the ordinary. Those that choose to spend time with the emotional rather than the colorful will find depth far beyond the extraordinary with the Hopper. In the end, much like art, it comes down to the subtle subjectivity of the viewer – and the gamer – to decide what is best suited to their tastes. As for me – well, I’m a lover of all art. Like I mentioned before, sometimes a choice like this with so many subtle and subjective details is difficult, like choosing your favorite child. All that said, there’s a reason my coffee table is graced by The Complete Works of Edward Hopper. I’m just sayin’. Not only have I been wanting both these games for a good while, the fact you have enough Art History background to make these very lucid and erudite comparisons in the games’ styles with artists— this fact makes this another kicka$$ and brilliant review.. and I am going to order these games right now !!!!!!!!!!!!!!!!!! !